Solve every Happy Glass level with these solutions! Find out how you need to draw the line to fill the Happy glass and finish your level when you are stuck at the game. The levels are listed below, look for the number you are stuck and play the video to see the solution. We have all Happy Glass Answers available for you. This page contains the answers for level 61 – 90. Press the button to see how to draw the line to get the solution for your level. For the other level solutions check the links below. 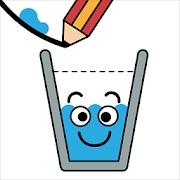 Please like this page if you solved your Happy Glass level. There are many more levels available. And the game will have continuously updates to give you more levels. We are still updating this page to give you the newest and complete level walk-troughs for Happy Glass. Meanwhile, enjoy this fantastic game! To solve a Happy Glass level you need to assure that the water is going into the glass. To do that you need to draw a line on the screen that guides it into the glass. If you can’t find out how to do this then just watch the answer video’s with the solutions on this page.